Congress president Rahul Gandhi arrived in Imphal on a two-day visit to Manipur for the Lok Sabha poll campaign. Soon after his arrival at the Imphal International Airport around 5 pm, Rahul Gandhi drove straight to Congress Bhavan in the heart of Imphal town and walked out to pay floral tribute at the Saheed Minar which was located on the eastern portion of historic mapal kangjeibung in Imphal. Guarded by good number security personnel Rahul along with senior congress leaders walked down to the iconic Ima Market (women’s market) and came back to Congress Bhavan in a well guarded SUV. Later he attended an extended meeting with Pradesh Congress Committee members at Congress Bhavan. Prior to the meeting, he also had an interaction with the party’s unit presidents of the assembly constituencies. On the second day tomorrow, the visiting Congress chief is scheduled to interact with the students at Manipur Film Development Corporation auditorium in Imphal East district followed by a public address at Hapta Kangjeibung at Palace gate in the same district. After addressing the meeting, he will be leaving for Agartala. Earlier in the day, Congress Legislature Party (CLP) leader and former chief minister O Ibobi Singh and Congress working committee member and Manipur Pradesh Congress Committee (MPCC) president Gaikhangam led senior congress legislators inspected the preparation works for tomorrow’s public meeting at Hapta Kangjeibung premises. 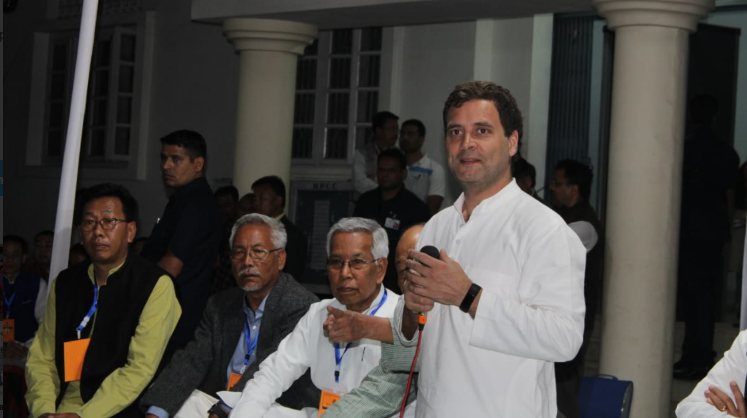 Interestingly, the Congress is yet to announce the names of its candidates for the polls which is scheduled to be held here on April 11 and 18 next. However, party sources claimed that the names of the candidates will be announced after tomorrow’s meeting. It may be noted that the last date for filing nomination for the Lok Sabha polls in Manipur is March 25 and 26. In view of the arrival of the Congress president, the necessary security arrangement had been made in and around the places where the AICC president is scheduled to visit. The Armed and unarmed security personnel were deployed in and around the Hapta Kangjeibung area in Imphal East district while similar number of police personnel were also seen around the Congress Bhavan and its adjoining areas.